The Economics of Ecosystems and Biodiversity (TEEB) (2018). 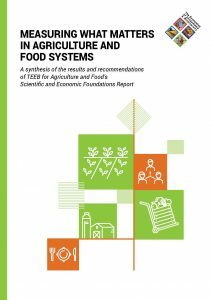 Measuring what matters in agriculture and food systems: a synthesis of the results and recommendations of TEEB for Agriculture and Food’s Scientific and Economic Foundations report. Geneva: UN Environment. February 2014- The Concept Note presents the case for and proposed outline content of a TEEB for Agriculture & Food study. December 2013 – The briefing note outlines existing guidance and examples on water quality accounting and identifies the ongoing challenges related to the development of natural capital accounting and water quality accounting. Inspired by the growing global focus on natural capital accounting, the note identifies the ongoing challenges related to the development of natural capital accounting and water quality accounting, in order to encourage debate and commitment towards effective water and biodiversity policy. sign up for the latest news and information.